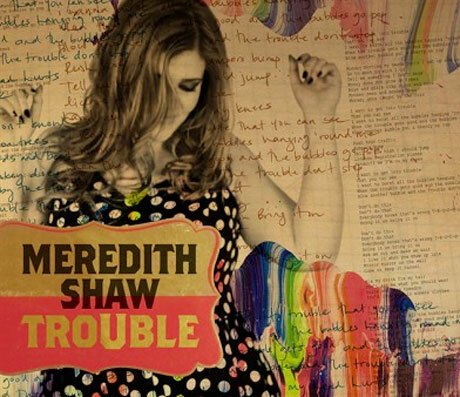 Rather than offer up a full-length follow-up to her 2011 debut LP Place Called Happy, folky Toronto pop artist Meredith Shaw is gearing up to release a trio of three-song EPs, with first instalment Trouble arriving May 28. A press release explains that the EP was recorded with Joel Plaskett at his New Scotland Yard Studios. Shaw began writing the titular song while spending time in Nashville last year, but Plaskett played on the song and nabbed a co-writing credit as well. A full preview of the track has yet to drop, but you can hear snippets from the EP in a teaser video that includes interview footage with Shaw and Plaskett. The EP also features new tunes "Call It a Night" and "Have You Met My Heart." While details on the second and third EPs have yet to arrive, the press release allows that forthcoming songs were co-written with the Trews' John-Angus MacDonald, Gordie Johnson of Big Sugar and more. "It means so much," Shaw said in a statement of collaborating with the other artists. "In this industry, you hope the people you respect will give you a thumbs-up to show you that you're on the right track. I am following my own creative heart, but I couldn't have more admiration for these three guys, and their opinion and approval is amazing." On top of the impending series of releases, Shaw has a handful of dates booked in Ontario and Quebec between May and June. You can see the details for the performances down below.